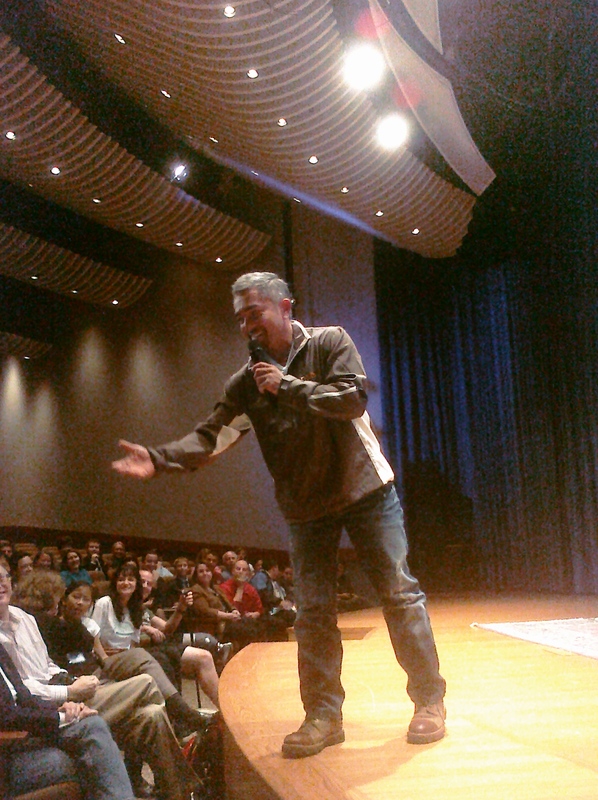 About 150 people came out to see Cesar Millan at National Geographic headquarters tonight, and he is just as funny, humble and engaging in person as he is on his show “The Dog Whisperer.” The event began with a preview of a show from his seventh season, which premieres Friday at 8 p.m. and features Cesar working with comedian and host of the television game show “Deal or No Deal” Howie Mandel. 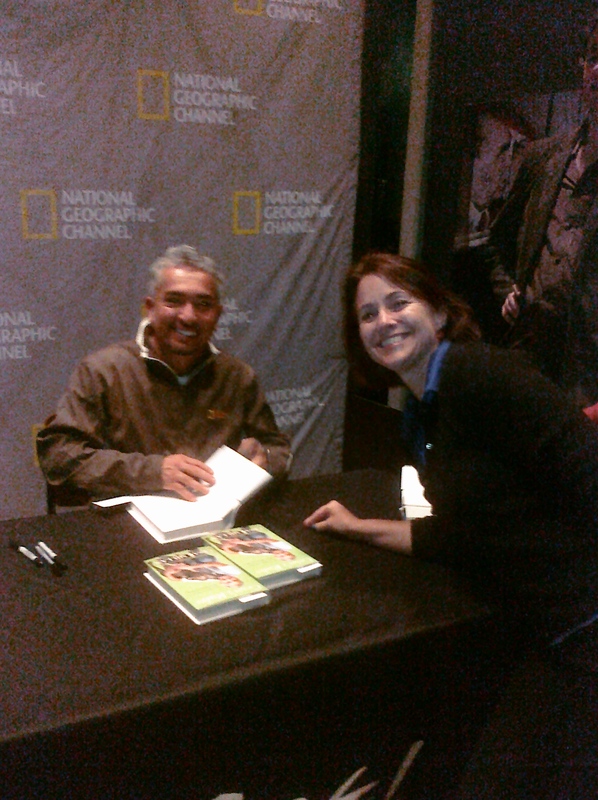 Cesar graciously signed four books...an early start to holiday shopping! Everyone knows celebrities can be eccentric, but Mandel takes it to new heights, running from the room in terror when his wife’s tiny Chihuahua growls at him. Lola, who weighs all of 2 pounds, rules the roost until Cesar arrives on the scene. With Cesar’s help, Mandel was eventually able to peacefully coexist with and even hold Lola, albeit wearing thick leather gloves. Cesar takes an audience question. An Iraq war wounded veteran undergoing treatment at Walter Reed asked Cesar how to handle his pit bull’s aggression towards other dogs. Cesar took the opportunity to stress that the breed is not the problem, the owner and training (or lack thereof) is. Keep an eye out for a show featuring the soldier, the audience encouraged Cesar to help him in a future show, and he brought his producer onstage to meet the family. When a woman asked him how to deal with fence aggression between her shepherd mix and the neighbor’s dogs, he brought her onstage and had her demonstrate how she addressed the situation–with Cesar very enthusiastically playing the part of the dog. Cesar was heading to New York City next, to appear on The Today Show with Hoda Kotbe and Kathie Lee Gifford tomorrow morning. His new book, “Cesar’s Rules: Your Way to Train a Well-Behaved Dog” goes on sale Tuesday Oct. 5. Since the audience got to buy the book tonight, I’m already ahead on my Christmas gifts for a few of the dog-lovers in my life! 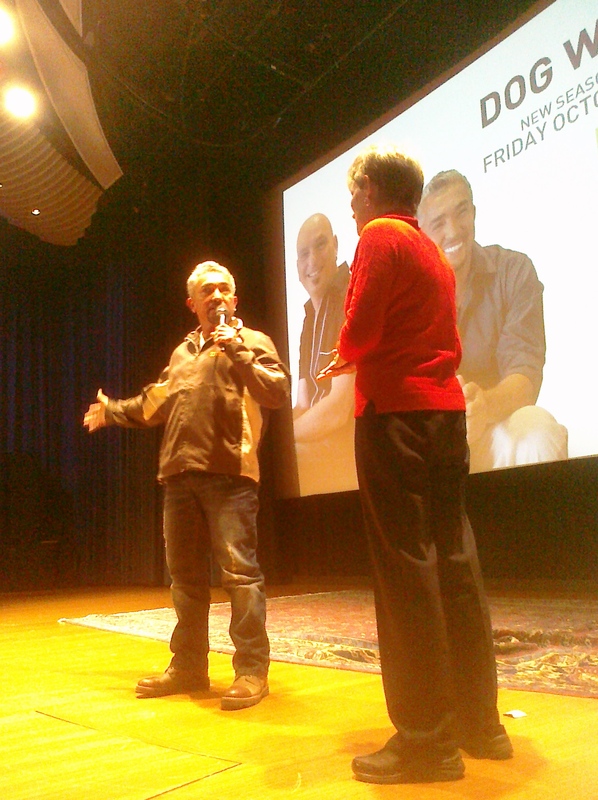 « Cesar Millan in DC tonight!